When Roger Waters left Pink Floyd after 1983’s The Final Cut, the remaining members had good reason to assume the band was truly, as Waters’ proclaimed, “a spent force.” After releasing solo projects in the next few years, David Gilmour, Nick Mason, and Richard Wright soon discovered they would never achieve as individuals what they did as a band, both musically and commercially. Gilmour got to work in 1986 on developing new solo material into the 13th Pink Floyd studio album, the first without Waters, A Momentary Lapse of Reason. Whether the record is “misunderstood, or just bad” is a matter for fans and critics to hash out. At the time, as Ultimate Classic Rock writes, it “would make or break their future ability to tour and record without” Waters. Richard Wright, who could only contribute unofficially for legal reasons, later admitted that “it’s not a band album at all,” and mostly served as a showcase for Gilmour’s songs, supported in recording by several session players. Uncertain whether the album would sell, the band only planned a small series of shows initially in 1987, but arena after arena filled up, and the tour extended into the following two years, with massive shows all over the world and the usual extravaganza of lights and props, including “a large disco ball which opens like a flower. Lasers and light effects. Flying hospital beds that crash in the stage, Telescan Pods and of course the 32-foot round screen.” As in the past, the over-stimulating stage shows seemed warranted by the huge, quadrophonic sound of the live band. 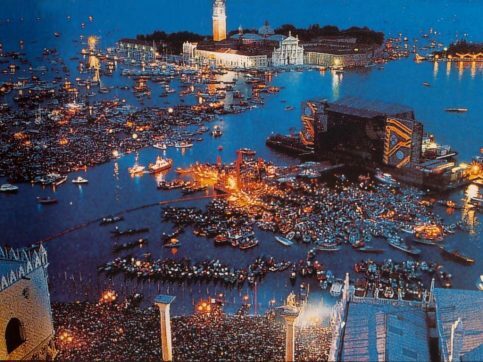 When they arrived in Venice in 1989, they were met by over 200,000 Italian fans. And by a significant contingent of Venetians who had no desire to see the show happen at all. Enraged afterward, residents shouted down the Mayor Antonio Casellati, who attempted a public rapprochement two days later, with cries of “resign, resign, you’ve turned Venice into a toilet.” Casellati did so, along with the entire city council who had brought him to power. Was the event—which you can see reported on in several Italian news broadcasts, above—worth such unsanitary inconvenience and political turbulence? The band may have taken down the city’s government, but they put on a hell of a show–one the Italian fans, and the millions of who watched from home, will never forget. See the front rows of the crowd queued up and restless on barges and boats in footage above, and at the top of the post, see the band play their closer in their 90-minute water-borne set, “Run Like Hell” from The Wall, with bassist Guy Pratt subbing in for the departed Waters. Hear a recording of the full show here. 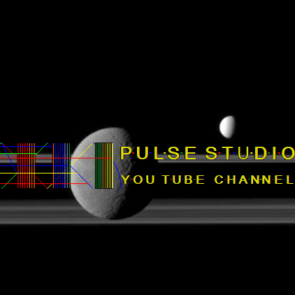 Posted by world.pulse on 9. May 2017.. Filed under Music,Pink Floyd. You can follow any responses to this entry through the RSS 2.0. Both comments and pings are currently closed.